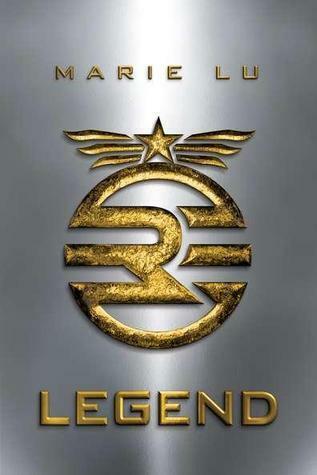 Legend was one of those books that got a lot of buzz in the book blogging community before it was released. So, I'd been wanting to read it for awhile and just happened to grab it on a whim when I saw it on display at the library last time I went. Well, life kicked in and it sat on my coffee table for several weeks before I was able to pick it up this week. And WOW, y'all. WOW. I finished this in two days -- but only because I made myself stop reading the first day because I had to get some sleep for work the next day. I ended up disregarding my need for sleep on the second night and stayed up way past my bedtime because I HAD to keep reading. Marie Lu knows how to write action and suspense. I loved figuring out the truth along with the main character, June. Her view of the Republic, her dystopian society, changes quite drastically in the book, but we walk along with her and understand just how she goes from A to B. And Day. You guys, Day is my Aladdin. Yes, I went there. I think Aladdin is hot. There I said it. I have the hots for a cartoon. I'd hang out with that "street rat" any day of the week! And same with Day. He has a Peter Pan thing going on -- yes, he has created a lot of trouble for his the Republic, but it's all to help others -- whether his own family or just people who are poor like him. Without getting spoilerific, I think it's safe to note that June and Day are pretty much the same -- only born into different circumstances. If the roles had been reversed, I'm pretty sure Day would have made the choices June makes and June would have made the choices Day makes. I love this dynamic of the book. Marie Lu came up with the idea for this story while watching one of my favorite plays, Les Miserables, and "wondering how the relationship between a famous criminal and a prodigious detective might translate into a more modern story." (That comes from the book jacket.) I love this, too! She has taken this idea and completely translated it and transformed it into a different society. I'm guessing we will get to learn more about who is on the other side of the war with the Republic in book two, and I'm looking forward to that. As for you, I release you from reading this review so you can go download Legend to your eReader, check it out from your library, or grab it from your nearest bookstore!